Samsung’s eagerly anticipated Galaxy S10 has been spotted on Geekbench ahead of its official unveiling. 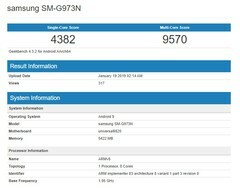 This is the second time in recent weeks that the S10 has made an appearance on Geekbench, although on this occasion it is running Samsung’s homegrown Exynos 9820 instead of the Qualcomm Snapdragon 855. As has been the case for some time, Samsung will ship the S10 models with Snapdragon chips to the US market and will fit the Exynos chips for models shipping internationally. Again, as in the past there will naturally be performance variations between the Galaxy S10 depending on market as a result, but broadly speaking they are absolutely comparable chipsets. On this occasion, the Exynos 9820-powered S10 outstrips the single-core performance of the Snapdragon 855 variant with a score of 4382 compared with a score of 3413. Both, however, are well off the single-core performance of the Apple A12 Bionic-powered iPhone Xs line. The A12 picks up a single-core score of 4797. The Exynos 9820 is clearly an excellent performer, however, and has gained ground on Apple in this regard. 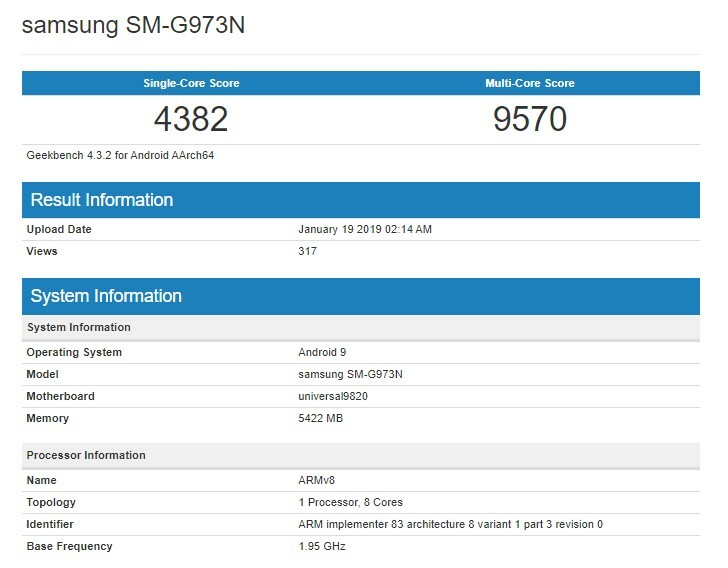 However, the Apple A12 kills both the Exynos 9820 and Snapdragon 855 in multicore performance with a score of 17931. The Exynos 9820 can only muster a multicore score of 9570 whereas the Snapdragon 855 puts in a respectable score of 10256. That said, in terms of everyday use, both the Exynos 9820 and Snapdragon 855 are still going to be very solid chips offering more than enough performance. Apple jumped to a 64-bit architecture for the A7 SoC first found in the iPhone 5S in 2013, a full year or more ahead of its competition, and has held that lead in chip design and performance ever since.